I am writing fewer reviews these days so only pick the books which really stand out for me. 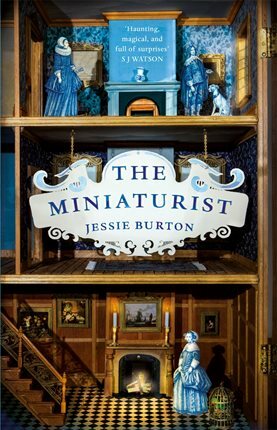 That is true of The Miniaturist by Jessie Burton, a debut which is now being released or eagerly anticipated all over the world. It was acquired by Picador in the UK for a six figure sum and went to auction in more than thirty countries. This kind of phenomenal success and the media attention which goes with it is very rare for a debut author and brings a lot of pressure to deliver. The proof sat on my bookshelf for a good couple of months before curiosity got the better of me. The Miniaturist is set in seventeenth-century Amsterdam (prompting inevitable comparisons with Tracy Chevalier’s Girl with a Pearl Earring) and I am not generally a fan of historical fiction set in the distant past. This ceased to matter the moment I began reading. It’s a sizeable novel and the fact that it only took me three days to finish is telling. The Miniaturist is narrated in the third person, present tense in the perspective of eighteen-year-old Nella, an unsophisticated country girl who has recently been strategically married off to wealthy Amsterdam merchant Johannes Brandt, a man twice her age. Also present under his roof are his forbidding unmarried sister Marin and two servants: Cordelia, who grew up in the local orphanage, and Otto, a black manservant and former slave. Unsurprisingly as a very young woman new to bourgeois society and city life, Nella finds it a challenge to adjust. She soon realises that all is not as it seems in the Brandt household. From the very beginning, Nella’s impressions and experiences come across in an exceptionally vivid and engaging way, which explains why this novel is able to win over people who think they don’t enjoy historical fiction. The characterisation and relationships have a universal resonance which transcend the period, although the marked feminist slant seems more of our time than hers. As portrayed, Amsterdam is a complex and fascinating place: a society struggling to reconcile the conflicting forces of commerce and religion, where women are subjugated and yet long to exert some control, where hypocrisy and deceit reign. It’s fertile territory. Whilst historical accuracy will be a consideration for some, the fact that the author succeeds in creating such a vibrant and authentic-feeling world was enough for me. It is fiction, after all. Nella examines the sugar loaf, a conical, glittering structure the length of her forearm, the crystals tightly compacted. […] The first white shaving lands in a curl at the base of the cone. […] Nella feels the shaving melt in her mouth, sweet and granular, vanished in a moment. It leaves a sheen of vanilla behind, and tacks her tongue onto her palate. Eight dolls are laid out on a stretch of blue velvet. So lifelike, so delicate; they are items of such humanly unreachable perfection. Nella feels like a giant, picking one up as if it might break[…] Wearing a neat grey dress, her minature stares up, a look of faint surprise across her frozen face. In one of her tiny hands is an empty birdcage, its door swinging open wide. Nella feels a strange sensation in her body, as if needles are pricking the inside of her skin. In the doll’s other hand is a minuscule note written in neat black capitals: THINGS CAN CHANGE. Once I realised this novel had something of the magical, I was seduced by it and the hyper-realist sensor that questions the plausibility of everything was switched off. Unfortunately, the book does have one significant weakness: one of the main strands of the narrative (since first posting this I have decided to be cryptic) is for a long time very compelling and it was disappointing not to see that sustained. A rather contrived scene towards the end left me feeling toyed with and suggested indecision about where to take this part of the story. It will be interesting to hear what other readers make of it. However, there are enough other layers for this flaw not to be fatal, with good handling of suspense and a satisfying blend of developments which could and couldn’t be guessed at (different for everyone, of course.) The author has the confidence to bring the story to a powerful and moving conclusion which avoids sentimentality. Jessie Burton is clearly a writer of talent and imagination. The merits of The Miniaturist are bound to be hotly debated; opinions will vary as they always do. Mine is that this is a genuinely enchanting novel. Is The Miniaturist on your wishlist? On Thursday I am delighted that Linda Grant will be joining me on the Literary Sofa to discuss her latest novel Upstairs at the Party, one of my Summer Reads 2014. I found The Miniaturist deeply disappointing – because of the over-hyping. I’m NOT saying Burton herself intended this, but there is a sense of fashionable issue tickboxery, all of which leads to some obvious ‘that would make a movie’ moments. And THAT I suspect created the possibility of bidding war. There has clearly been a HUGE amount of money thrown at the promotion of the book. And it raises everything i get suspicious about in the publishing and reviewing world – books as commodities. Jessie Burton for sure is an interesting writer, and will no doubt hone and craft what she does – but she isn’t the writer the hype is suggesting her to be. I’m fascinated to see that the BULK (not all, but the BULK of the 5 star raves on Amazon appear to be written by people who have only reviewed no books, or very few books, There are not so many of the 5 stars which are written by people who seem to review quite a few books. I do believe that a lot of the critical reviews she is also attracting are critical because the hyping has brought in, perhaps, a more sophisticated group of readers, and it is those who are responding somewhat crossly. Had I not been seduced to expect some extraordinary cross of Donna Tartt, and Tracy Chevalier mixed with a soupcon of Deborah Moggach at her best and even A.S Byatt I would have started my read without expectations and allowed the pleasures and faults of Burton’s book, and appreciated it better for what it is, rather than crossly miss what it isn’t. To be honest, I got this as an ARC, and had it NOT been an ARC would not have bothered to finish it as the first 70 pages had me frustrated with the authorial voice which seemed to be trying too hard. But then, I was expecting something extraordinary. By contrast, I recently read a possibly undersold first novel, Rebecca Mascull’s The Visitors, which I began with ‘possibly interesting and worth reading’ perceptions and ended up being absolutely blown away by what the writer had done. However, it isn’t a book with any sort of obvious filmic possibilities, so bidding war fever was never on the cards. I am fascinated with WHY certain books have a degree of absolute overkill publicity, and others, – which may be AS good – or better, maybe, don’t. Is the author, their book, and the subject matter a package, perhaps? Will the author be comfortable if a media circus is created, or shy away. Sorry for the length of this! Thanks for your comment, and don’t apologise, thoughtful contributions are always welcome here (I also saw your review of this title on Amazon). I share your fascination with how it’s decided which books are deemed to merit the big investment/publicity effort etc. Many really good books get very little, if they even get published at all. It would be very interesting to have an understanding of the economic model in operation but I guess the bottom line is that having paid a very large sum for the manuscript, vigorous publicity efforts are logical and hype pretty much guaranteed because everyone is so keen to find out what all the fuss is about. To an extent, it doesn’t matter if the book actually is any good – it will sell regardless. It doesn’t surprise me that you were underwhelmed given the expectations you went in with – it would be a rare debut novelist indeed who could deliver all that! I don’t like huge book hype either but it tends to have the exact opposite effect: I approach with great trepidation, almost expecting to be disappointed. In this case, I wasn’t – although I do still feel strongly that too much was left unexplained. I’m almost at the stage where the only reviews i trust are those from dedicated readers OUTSIDE the professional reviewing community, and moreover those outside reviewing ranking on Amazon, curiously enough. The professional reviewers are a little back-scratchy, as many of them are also writers, and there’s a sense of if i am critical about YOUR book you may well be critical back about MINE. I have been suckered by excellent writers praising REALLY BAD other writing, not just the ‘do you get on with the authorial voice’ stuff, but glaring inconsistencies, cheap tactics in plot driving, bad writing etc etc. So the fact that an excellent writer praises another means nothing any more. The Amazon rankings have got way too loaded, with so many reviewers washing their negative votes, tactical voting – and the certain knowledge that the damn a book is to attract the negatives from its fan base, so i do believe some are not quite saying what they mean! Book blogs are the way to go, for me, as in a sense there is very little ‘agenda’ for the blogger to gain – particularly if – as most of us seem to – someone can only like a post, but not dislike it. And you get better comments as the blog owner can just ban someone who is only wanting to be offensive about a differing opinion. Finally, I am also a huge fan of Patrick Flanery’s writing and included his novel ABSOLUTION in my Summer Reads 2013 selection. That actually was a debut that read like the work of a seasoned novelist. It’s about time I read FALLEN LAND actually – been saving it. Oh DO read Fallen Land. I read it with bated breath to start with, as he had set such a high standard for himself with Absolution, and I was (needlessly) fearful of a second novel fall. Of course, come the third, the expectation mountain he has set is even higher. Every so often, I given in and read a book that has been hugely hyped. I’m almost always left deeply disappointed. It is usually because of the expectations I bring to it, rather than there being something fundamentally wrong with the book itself. I’ve realised that most commercial fiction just isn’t my thing. Nonetheless, I felt compelled to read The Miniaturist, because the premise was so compelling. And therein, ultimately, lies the problem too. The story, and especially the ending, does;t live up to the hook. I didn’t find the ending of the book satisfying in any way – in fact, one central storyline (as you mentioned) is explained away in a very unsatisfactory manner. I felt very let down – if I’ve been promised that something is fascinating and intriguing, I need a convincing denouement. I can think of a handful of ways to conclude that particular strand in the novel that would have been more interesting and convincing, and which Jessie Burton could have certainly pulled off. So I’m left wondering why she didn’t, or why her editors didn’t steer her in a different direction. Jessie Burton is certainly a talented writer. The descriptions, scene-setting and sensory detail were wonderful. The characters were excellently drawn too (apart from Nella, who was, for me, the least interesting and the character with the least development across the novel). This is not one of those books that is cynically bad (The Kite Runner) or workman-like commercial (One Day). It’s a book that’s frustrating because I think if the author had pushed herself (or been pushed) it could easily have been excellent. I’ve not long started this – I wasn’t going to fall for the hype, but it was £1.80 on the Kindle so I thought I’d see what all the fuss is about! I’m loving it, so far, but that may change…there are many books just as good, if not better out there, no doubt, but once a book gains traction publicity-wise like this has there’s no stopping it. Jessie Burton’s also a publisher’s dream – genuinely lovely and shocked by her success, and very photogenic – that shouldn’t matter, but it does help. Reminds me of Zadie Smith in that respect. I’m with Rachael on the great expectations thing; I get very excited about books and they invariably can’t live up to my huge expectations. I didn’t think The Kite Runner was bad though; I liked it, and A Thousand Splendid Suns. Another one who was disappointed- particularly by the ending. I won’t post too many spoilers but I found the lack of information/explanation about the eponymous miniaturist really frustrating- I was so compelled by her story more than Nella’s, and would have loved to have learnt more. That said, the prose was beautifully written and the characters were well drawn, particularly Marin and Cordelia. I would definitely pick up Jessie Burton’s next. I have just finished the book The Miniaturist and I really enjoyed this book it wasn’t the book I tend to read it was a good mix of historic family and trust however the end of the book left me wondering what next?? WILL there be a follow up what happened to the miniaturist and the family?. That was the issue I felt was left hanging and that was frustrating. Never occurred to me to wonder about a sequel though. I’d be surprised. I resisted this book for ages because of the hype, but I have really enjoyed it. For what it’s worth, I took the miniaturist to be a metaphor for the author – in charge of the characters she creates, and yet also not in charge once she has created them. The cabinet itself represented the book. So it didn’t bother me that we never find out who she is, because in a way she was just a reflection of/pointer to Nella’s dawning awareness of what was really going on around her. My only slight criticism was that Nella seemed much too grown-up for her age (although re-reading the first chapter again, maybe that was just because we were seeing everything from her point-of-view: the miniaturist herself saw her differently). That’s a very novel and interesting interpretation! Glad you enjoyed it. I agree – great interpretation! It wouldn’t even have occurred to me, but makes perfect sense! I like your review. This book was a little over-hyped but is still a great book. I think Jessie is a great writer and this book was so different to other historical fiction books I have read. Full of historical detail and intrigue. I just finished reading this book and reviewed it also if you would like to check out my review too.